Snowflake badge beside your username in chat. Gold VIP status for as long as you stay subscribed. *(Snowlit hangs out there & sometimes plays games with subs off-stream). Bypass spam/link filters & slow-mode chat. No ads during your viewing experience. Priority in squads/parties in multiplayer games. Added to Snowlit’s Steam/Bnet/PSN friends list. Don’t have to be present to win giveaways. Directly support Snowlit & keep the stream running! 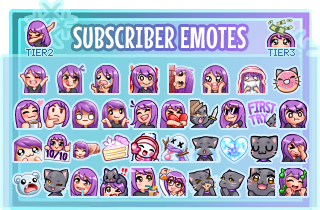 At least 38 exclusive sub-only emotes to use anywhere on Twitch! Click here for the Snow Army Subs-Only page!